Did you know that Indonesia is the second-largest contributor to marine plastic pollution after China? A recent study estimates that between 1.14 million and 2.40 million tonnes of plastic enter the oceans every year from Indonesian rivers. These days, sea turtles are ingesting twice the amount of plastic they were 25 years ago. In total, it is estimated that ingestion of plastic kills 100,000 marine animals and 1 million marine birds every year, as they often mistake plastic bags for food such as jellyfish. 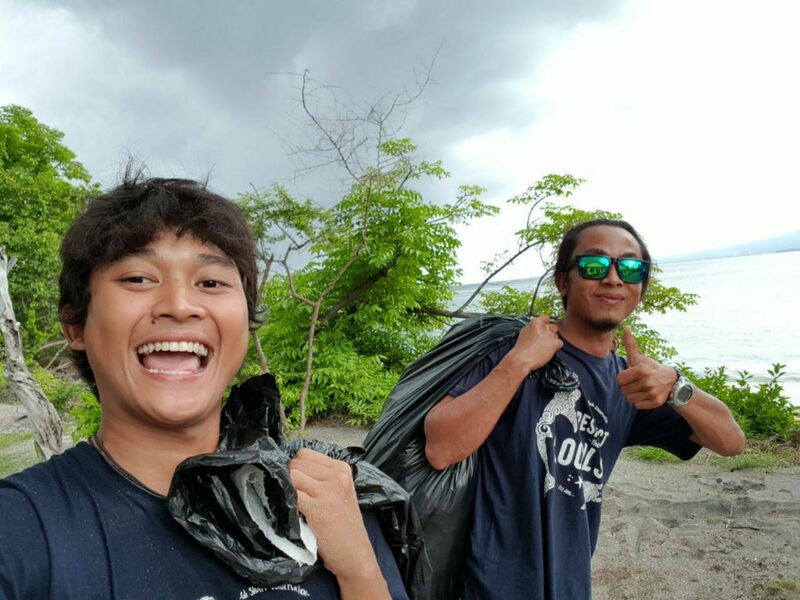 Together with the businesses on Gili Air we’re organizing weekly beach clean-ups and underwater clean-ups. Throughout the week, beach clean-ups take place in many different locations around the island. Lasting around 45 minutes, it is an excellent way to give back to our beautiful island home. It is also a good way to catch up and make new friends who share your passion for conservation! Special guests also join in our clean-ups, including TrashHero. To know when and where the beach clean-ups start, check out the community calendar or visit our Facebook page where we announce the events for the week every Monday. Our underwater clean-up happens every Friday morning at 8.30am from Oceans5 Dive Resort. As part of Project Aware’s ‘Adopt a Dive Site’ initiative, we adopted Meno Slope in 2017. Across just one year, 56kg of trash has been removed from the ocean during our weekly clean-up dives. We are very proud to be part of this movement and never miss a Friday. It is free to join this special dive and all certified divers are welcome to take part! If you would like to take part in it, sent us an email (sharks@gilisharkconservation.com) at least one day before or pass by Oceans5 Dive Resort to sign up for it. Because we truly believe that little by little, a little becomes a lot. Read here about the 5 reasons everyone should join a beach clean up & check our Facebook page to see when our next clean up will be.